21.11.1908: Launched by A. Hall & Co Ltd, Aberdeen (Yd. No.447) for James Chant (32/64), Plymouth & Thomas Paddon (32/64), South Brent as PELICAN I. 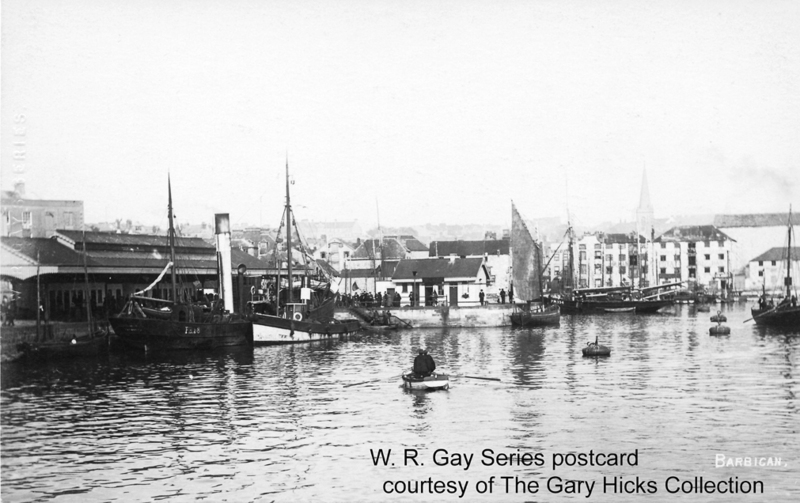 10.12.1908: Registered at Plymouth (PH98). James Chant appointed managing owner. 14.12.1908: Vessel mortgaged (64/64) to Lloyds Bank Ltd, London (A). 26.9.1912: Sold to Chant & Paddon Ltd (64/64), Plymouth. 26.9.1912: James Chant & Herbert William Chant appointed managers. 11.11.1914: Requisitioned for war service as a minesweeper (1-12pdr) (Ad.No. 527). 26.910.1917: Sold to Noah Ashworth & Cecil Whittaker Barratt, Fleetwood (joint owners 64/64). 31.10.1917: Vessel mortgaged (64/64) to The London City & Midland Bank Ltd, London (C). 8.11.1917: Joseph Allen Taylor appointed manager. 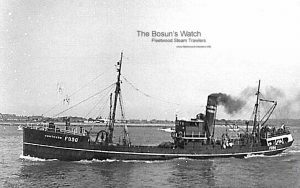 14.2.1918: Sold to The Red Rose Steam Trawlers Ltd (64/64), Fleetwood. 13.3.1918: Vessel Mortgaged (64/64) to The London City & Midland Bank Ltd, London (D). 11.1914: Requisitioned for war service as a minesweeper (1-12pdr) (Ad.No.527). Based Swansea. 2.1919: Returned to owner at Fleetwood. 22.2.1919: Registered at Fleetwood (FD7). 1927: Sold to Cevic Steam Fishing Co Ltd, Fleetwood (Charles H. Friswell, manager). 18.4.1928: Registered at Fleetwood as CEVIC (FD7). 14.8.1931: At Campbeltown Sheriff Court, Sk. John Thomas Newton admitted a charge of illegal trawling in the Firth of Clyde following arrest by HMS SPEY and was fined £50 with forfeiture of net and gear. 8.11.1931: Homeward from fishing grounds in early morning in poor weather stranded on Jura side of Sound of Islay. Salvage steamer RANGER (409grt/1880) and salvage surveyor in attendance. Later refloated and berthed alongside Port Askaig Pier. Subsequently returned to service. 6.6.1933: In the evening in thick fog 2 miles NW of the Point of Ayre, Isle of Man in collision with steam trawler EXMOUTH (FD336) sustaining damage. At 11.30 pm. berthed at Ramsey, badly damaged and making water. EXMOUTH with damaged stem returned to Fleetwood. Both trawlers repaired and returned to service. 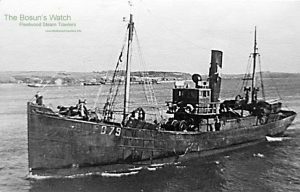 9.3.1943: Requisitioned for war service and fitted out as a fuelling trawler (33ton tank for refuelling diesel landing craft) (P.No.Y.7.16) (Hire rate £62.0.0d/month). 3.1944: Fitted out as a water carrier. Assigned to Operation Neptune – Normandy landings. 23.5.1944: Assigned as a water carrier to Force O. 6.5.1953: Last landing at Fleetwood. 5.1953: Sold to Sk. William Summers & John William Johnstone, Aberdeen (John William Johnstone managing owner). 1.6.1953: Registered at Aberdeen (A722). 4.1957: Sold to Germany for breaking up. 03/11/2017: Removed FMHT watermark from image. This entry was posted in Steam Trawlers, Steamers (Picture) and tagged Cevic SFC, Red Rose Trawlers on May 18, 2012 by Fred Smith. 28.6.1919: Launched by Cochrane & Sons Ltd, Selby (Yd.No.899) (“Mersey” class) for The Admiralty as ROBERT MURRAY (Ad.No.4256). 23.02.1920: Registered by The Admiralty at London (Part I & IV) as ROBERT MURRAY O.N.144393 (LO337). 26.02.1920: Completed as a fishing vessel under Special Survey of Lloyd’s Register and classed 100A1 Stm Trawler at Hull; ex fishing gear. 01.1921: Not to proceed to Chatham as previously ordered but to remain laid up at Hull pending further instructions. 01.1922: Scheme abandoned, the necessary working capital of £100,000 having not been subscribed. 3.1923: Sold to Irish Free State Government, Dublin. 4.5.1923: Commissioned in the Irish Free State Coastal & Marine Service, Dublin. 31.3.1924: Decommissioned. Transferred to Commissioners of Public Works in Saorstat Eireann, Dublin (James J. Healy, manager). 26.1.1926: Sold to George L. Young & Richard M. Fleming, Culdaff, Co. Donegal. 2.1926: Sold to Cygnet Steam Fishing Co Ltd, Fleetwood. 11.2.1926: Registered at Fleetwood (FD90). Thomas Cardwell designated manager. 19.4.1927: Sailed Fleetwood for St. Kilda with a survey party, mails and provisions. 1929: Fleetwood top trawler (558 tons). 15.10.1934: Arrived Fleetwood and reported stood by Liverpool steamer HUBERT (3946grt/1910), Liverpool for Troon which had broken away from Glasgow tug CHIEFTAIN (196grt/1930) in Morecambe Bay in heavy seas and galeforce winds. Tug reconnected and proceeded on passage. 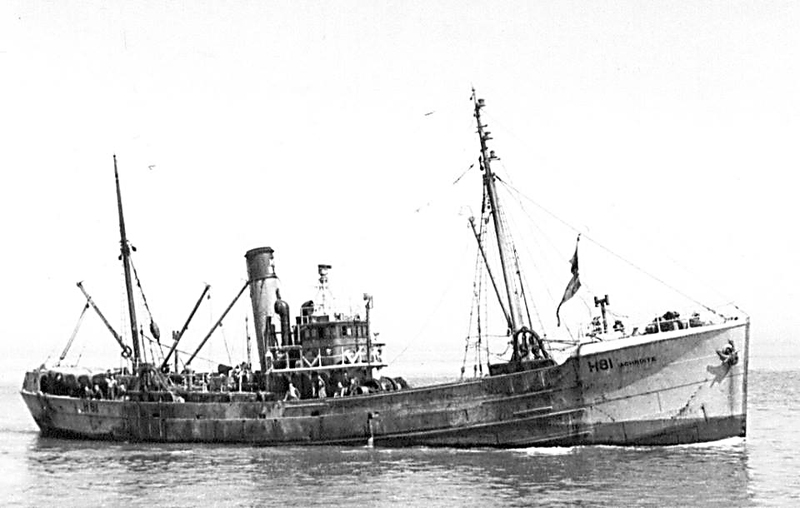 1935: Fleetwood top trawler (576 tons). 14.4.1938: Sold to Thomas Cardwell & Robert H. Bagshaw, Fleetwood. R. W. Mason designated manager. 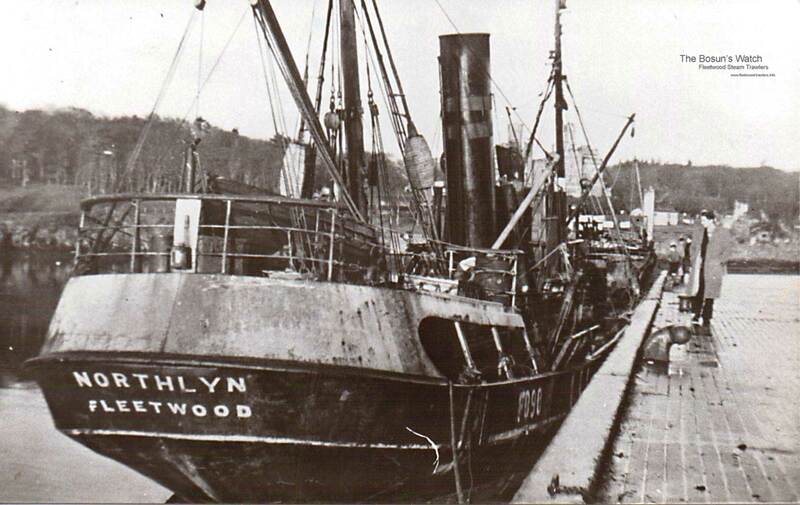 26.5.1938: Registered at Fleetwood as NORTHLYN (FD90). 14.2.1939: Sailed Fleetwood for West of Scotland grounds (Sk. Harry Maulkinson); twelve crew. 16.2.1939: Put into Campbeltown with boiler trouble. Whilst alongside caught fire in forecastle, hoses rigged but too intense to extinguish and pulled away from quay and beached to prevent damage to other craft. Fire damped down, pumped clear of water, re-berthed and fire extinguished by local brigade. 17.2.1939: Arrived Fleetwood from Campbeltown under own power. 27.6.1939: Sold to Robert H. Bagshaw, Fleetwood. Robert Bagshaw designated managing owner. 7. 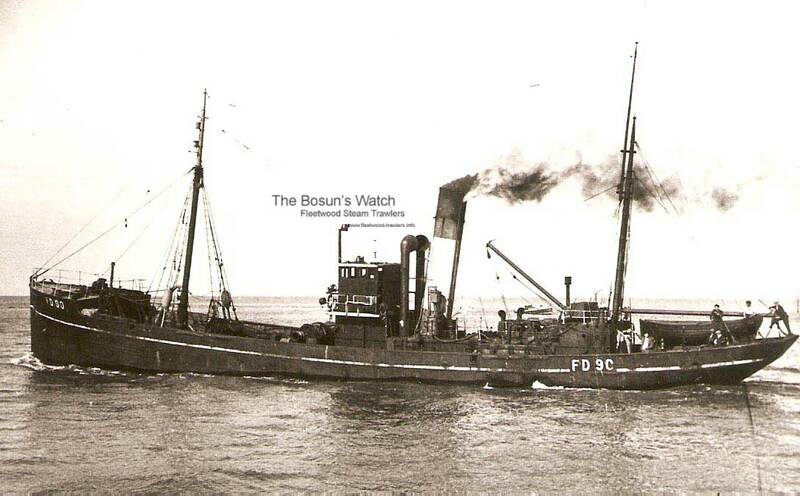 10.1939: Requisitioned for war service as a boom defence vessel (P.No.Z.103) (Hire rate £105.6.0d/month). Cost of conversion £15,596. 18.11.1943: Sold to The Cevic Steam Fishing Co Ltd, Fleetwood (Richard Neave, manager). 7.12.1943: Compulsorily acquired by M.O.W.T. 23.5.1944: Assigned to Operation Neptune – Normandy landings. 1945: Based at Portsmouth/Portland (Fraser & White Ltd, Portsmouth, agents). 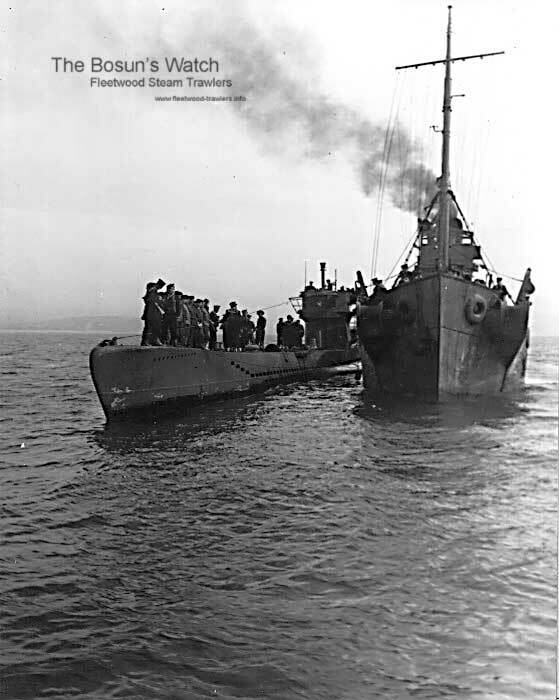 10.5.1945: In Weymouth Bay escorted Uboat (U249) to Portland for formal surrender. The first U-boat to surrender following cessation of hostilities. U.236 had surfaced off the Isles of Scilly on 8.5.1945 and indicated to a US Airforce Liberator based at Dunkerswell, Devon that she wished to surrender. Escorted by HMShips AMETHYST (P.No.U16) and MAGPIE (P.No.U82)_) and delivered to Weymouth Bay. 11.1945: Paid off, C&M at Rosyth. 12.1.1946: Fleetwood registry closed. Estimated cost of re-conditioning £7,500. 7.3.1947: Sold to The Cevic Steam Fishing Co Ltd, Fleetwood. Re-registered at Fleetwood (FD90). Richard Neave appointed manager. 4.1.1955: Sold to Saint Andrew’s Steam Fishing Co Ltd, Hull. Basil Arthur Parkes designated manager. 4.1955: Sold to Jacques Bakker en Zonen, Bruges for breaking up. 28/01/2009: Page published. 5 revisions since then. This entry was posted in Steam Trawlers, Steamers (Picture) and tagged Cardwell & Bagshaw, Cevic SFC, Cygnet SFC Ltd, Mersey Class, Robert Bagshaw on January 28, 2009 by Fred Smith. 1918: Launched by Cochrane & Sons Ltd, Selby (Yd.No.838) (“Mersey” Class) for The Admiralty as WILLIAM JACKSON (Ad.No.3831). 27.4.1918: Completed (1-12pdr, hydrophone and W/T). 3.2.1920: Registered by The Admiralty at London as a fishing vessel (LO293) Official No.143857. 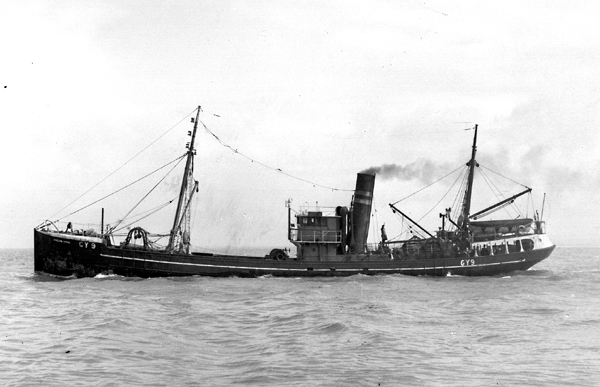 6.1921: Sold to Pickering & Haldane’s Steam Trawling Co Ltd, Hull (John McCann & Edward Cartwright, managers). 11.6.1921: London registry closed. Cochrane & Sons Ltd contracted to refurbish as a fishing trawler, allocated yard No.754. 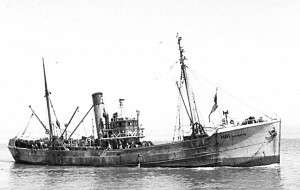 7.1921: Converted to a fishing vessel by Cochrane & Sons Ltd, Selby (Yd.No.754) – 327g. 5.7.1921: Registered at Hull (H288). 18.8.1921: Registered at Hull as LORD BYNG (H288). 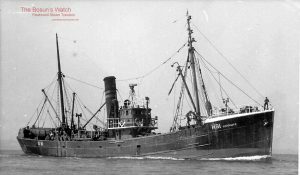 24.1.1929: Sold to The Bunch Steam Fishing Co Ltd (64/64), Grimsby. 29.1.1929: Walter Crampin appointed manager. 29.1.1929: Registered at Grimsby (GY9). Fitted for lining to pursue the Greenland halibut fishery. 16.10.1930: Herbert G. Crampin appointed manager. 18.9.1935: Vessel (64/64) mortgaged to National Provincial Bank Ltd, London (A). 19.5.1936: Sold to Boston Deep Sea Fishing & Ice Co Ltd, Fleetwood. 26.5.1936: Basil A. Parkes, Cleveleys appointed manager. 13.6.1936: First landing at Fleetwood 337 boxes £546 gross. First box of fish sold to J. Noble for £3.2.0d. 28.7.1936: Registered at Grimsby as EVELYN ROSE (GY9) (BoT Minute RG No.1305/1936 dated 29.7.1936.. Operating out of East Coast ports. 27.11.1939: Vessel mortgaged to Midland Bank Ltd, London (B). Pre 4.1940: Employed on Fishery Protection (WAS/Fort William/Fleetwood). with GAVA (FD380) as Leader (Ty/Sk. F. Day) and DHOON (FD438), EDWINA (FD205), JACINTA (FD235) and VELIA (FD49). Ramsgate. Repaired and fitted out for auxiliary patrol duties (P.No.4.136). 5.1941: Fitted out as a minesweeper. 1945: Returned to owner (Basil A. Parkes, Cleveleys, manager). 7.8.1945: Sold to The Cevic Steam Fishing Co Ltd, Fleetwood. 13.8.1945: Richard Neave appointed manager. through the Sound of Islay. forenoon but could not seal the hull. 24.11.1949: Part catch discharged to CEVIC (FD7) for shipment to Fleetwood. 26.11.1949: Part catch landed (£780 gross). 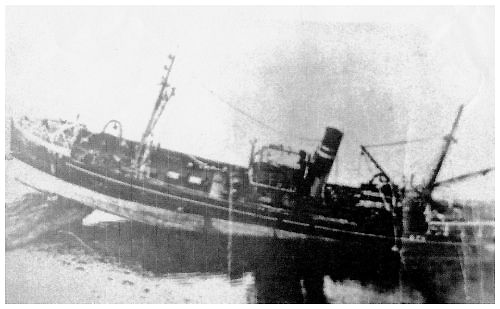 1.12.1949: Refloated by Liverpool & Glasgow Salvage Association vessel RANGER (408grt/1880) and berthed at Port Askaig Pier. 4.12.1949: In Wyre Dock found to be making water but high winds prevented tug putting her on slip; pumps activated. 5.12.1949: Placed on slipway and hole discovered in shell plating port side forward. 6.12.1949: Placed on grid for repair. 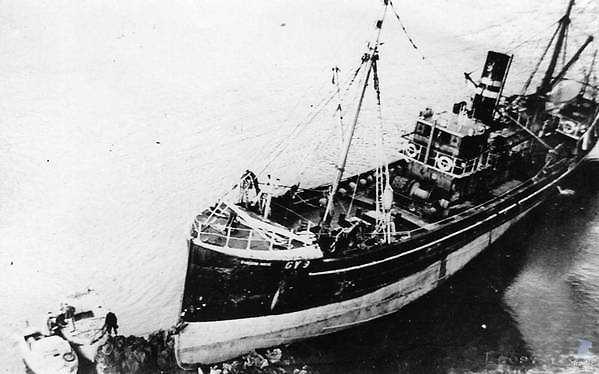 2.1950: Repairs completed and returned to fishing. 30.12.1954: Early morning sailed Fleetwood for Faroe fishing grounds (Sk. William Dawson); fourteen crew all told. 31.12.1954: At 12.30 am. with the Bosun on watch, Skipper and a lookout in the wheelhouse, stranded about 15 yds from Ardtornish Light, Morven while in transit through the Sound of Mull in southerly wind, fresh breeze, good visibility. Observed by the Mate that she had rode up forward which lowered the stern and she was taking in water aft. While attempting to launch the boat and the Skipper trying to contact Oban Radio Station, the trawler slipped off the rocks and foundered quickly. The two survivors* were thrown into the water, the mate using two fish baskets swam to the shore and met the deckhand. Seeing no other survivors on the shore, the pair set off to summon help and walked barefoot five miles round the head of Lochaline to Ardtornish estate office. Mr S. Henry, the factor, informed the police and organised a search party but in the darkness there was no sign of the ship or any survivors. In daylight the body of the fireman was discovered and that of the deckhand a little later. Both survivors and the two bodies taken by motor boat to Oban. (Position of wreck is uncertain possibly located in 130m, 400m from shore. (Original loss in approx position 56.31N 5.45W in 60-80m)). Grimsby registry closed. 23.7.1955: At MoT formal inquiry (S.433) at Fleetwood the court found Sk. Dawson had made an error in navigation by misinterpreting the image on the radar screen, resulting in the vessel stranding. * Survivors – William Crawford (40), Mate, Fleetwood and Ernest Meyer (33), deckhand, Great Harwood. Lost – Sk. W. Dawson, Fleetwood; C. Holder, Bosun, Fleetwood; R. Barton Ch Eng, Fleetwood: R. Leadbetter, 2nd Eng, Fleetwood; K. Atkins, Wythenshaw, J. Salthouse, Blackpool, C. Chard, Fleetwood, A. McDermott, Fleetwood, C. R. Holden and R. W. E. Barlow, Deckhands; L. F. Evans, Blackpool and D. J. Rees, Fleetwood, Firemen; H. Saunders, Bradford, Cook. Bodies recovered – Leonard Evans, fireman and Frederick Thornton, deckhand. 27/01/2009: Page published. 9 updates since then. 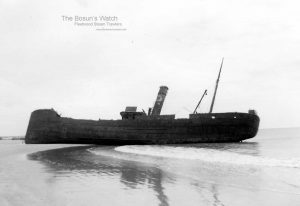 This entry was posted in Lost Vessels, Steam Trawlers, Steamers (Picture) and tagged Boston DSF & I, Cevic SFC, Lost, Mersey Class, Parkes on January 27, 2009 by Fred Smith. 29.8.1912: Launched by Cochrane & Sons Ltd, Selby (Yd.No.537) for Soc Anon des Pêcheries à Vapeur, Ostend as ISA. 9.10.1912: Completed. Registered at Ostend (O81). 28.10.1914: Commenced fishing from Milford. 6.2.1915: On the Irish grounds (Capitaine Louis Philippe Dedrie), sighted the TERESAE of Genoa in difficulties. In choppy seas and WNW strong breeze connected and commenced tow to Milford. 8.2.1915: Delivered Milford after stormy passage. 27.10.1916: Fishing off the Smalls in gale force conditions (Capitaine Louis Philippe Dedrie) sighted smack FIERY CROSS (R281) with damaged mizzen and no steerage. With difficulty hauled net and connected to casualty to tow her clear of the Smalls. At 2330 in heavy seas, tow parted. 28.10.1916: At dawn in blinding rain ENE of the Smalls the tow was reconnected but at 2330 making for the entrance at St. Ann’s Head the tow parted again. Just before midnight tow was reconnected. 29.10.1916: At 1330 delivered Milford. 29.5.1917: Requisitioned for Fishery Reserve (with owners permission). 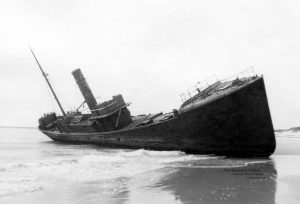 12.6.1917: On Irish grounds (Capitaine Louis Philippe Dedrie) at 0100 picked up a boat with twenty-three survivors from the BAY STATE (6583grt/) torpedoed (10.6) by U.66 250 miles NW of Fastnet. 18.6.1917: Sailed Milford for fishing grounds off Ireland (Capitaine Louis Philippe Dedrie). 20.6.1917: Picked up eighteen crew members of ENGLISH MONARCH (4947grt/1905) torpedoed without warning three days previously (18.6) by U.24 300 miles NW of Fastnet (52.06N 17.30W). Survivors in poor shape after 60 hours in boat. Set course for Milford. 21.6.1917: Stopped by two patrol vessels and told not to proceed as enemy submarine in the area. Landed survivors at Queenstown and returned to fishing. 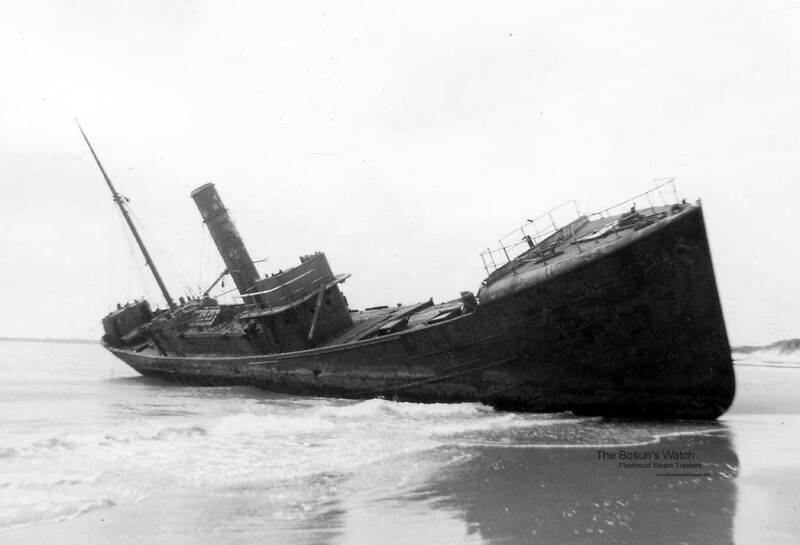 2.7.1917: Off Bull Rock (Capitaine Louis Philippe Dedrie) at about 2300 picked up twenty-four survivors of the Italian steamer PHOEBUS (3133grt/1894) torpedoed (30.6) by UC.44 off Berehaven. Hoisted boat and proceeded to Milford. 3.7.1917: Transferred survivors to RN sloop. 1917: Fitted with 6pdr gun at Swansea. 4 12.1917: Fishing south of the Smalls (Capitaine Louis Philippe Dedrie). in company with EMMANUEL (O87), ARIES (M97) and LOLIST (LT427). About 6.00 am. a submarine surfaced about 11/2 miles away. Trawlers hauled and under smoke screen, Capt Dedrie hoisted White Ensign and zig-zagged at speed towards the submarine firing all the time. Pursued submarine for 18-20 miles before he submerged. 1919: Released. John Bauwens, manager. 30.12.1919: Last landing at Milford. 23.11.1928: About 10 miles ENE of the Smalls, stood by Belgian trawler LUCIENNE-JEANNE (O153) (S.A. Pêcheries du Nord, Ostend) in distress. 4.1930: Sold to The Cevic Steam Fishing Co Ltd, Fleetwood (Charles H. Friswell, manager). 4.4.1930: Registered at Fleetwood as ISER (FD79). 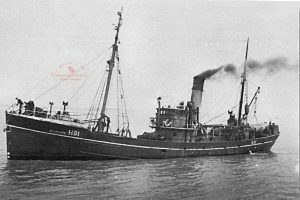 10.8.1932: Arrived Tobermory with Belgian trawler ALBERT (O75) (Pêcheries à Vapeur, Ostend) in tow picked up 12 miles off Helsker with net fouling propeller. 23.01.1934: Caught in a severe storm off the Isle of Man. Crew barricaded the engine room door to keep the water out. 6.1935: On a trip to Donegal Bay grounds (Sk. Somers). 22.6.1935: Seized by Civic Guards disguised as fishermen whilst fishing in prescribed area of Glengad Head and trawler taken into Loch Swilly by local fishermen. 22.6.1935: At Letterkenny, Co. Donegal, Sk. Somers fined £37 and trawler detained pending payment. Fleetwood trawlers seen as a “poaching menace”. 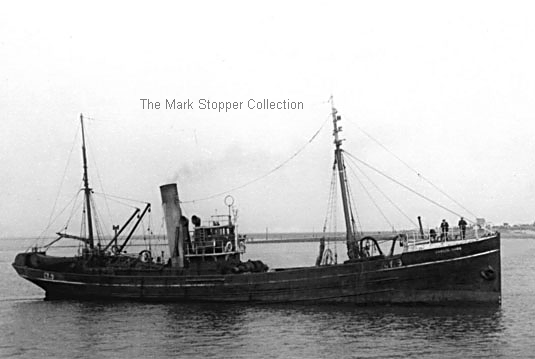 2.1943: Sold to R. G. Parsley, Milford Haven (Don Trawling Co (Milford Haven) Ltd). 15.10.1948: When off St. Ann’s Head (Sk. E. Bracher), contacted by STAR of PEACE (M133) (Sk. J. Mair) which had sprung a leak. Crew taken onboard, but Sk. Mair stayed behind; at 7.00 a.m. connected and commenced tow. At 9.30 a.m. Sk. Mair left the ship and shortly afterwards she went down. 12.05 p.m. Crew landed at Milford. 20.8.1953: Last landing at Milford. 1.1954 Sold to BISCO and allocated to Thos. W. Ward Ltd, Sheffield for breaking up. 9.1.1954: Arrived Castle Pill, Milford Haven. 26/01/2009: Page published. 6 updates since then. 14/05/2017: Removed FMHT watermark from image. This entry was posted in Steam Trawlers, Steamers (Picture) and tagged Cevic SFC on January 26, 2009 by Fred Smith.